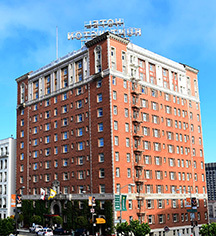 Located in the prestigious Nob Hill neighborhood near fine dining and shopping, The Huntington Hotel is a luxury San Francisco hotel with stunning skyline views. Regal and elegant, the hotel blends classic grandeur and San Francisco culture with modern elements for a thoroughly unique and relaxing stay. The Huntington Hotel features one-of-a-kind accommodations with high technology and whimsical décor. Each of the 134 guestrooms, including three exclusive suites, features WiFi, an iPod® docking station, USB ports and electrical charging stations, and work desks. An icon of the San Francisco restaurant and bar scene, The Big 4 is known for its locally-sourced cuisine, live piano music, and timeless atmosphere. Relax and unwind at the hotel’s three-level, full service spa with treatment rooms, saunas, steam rooms, and an indoor pool. 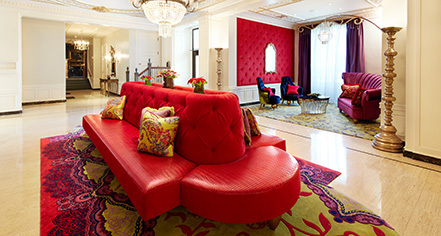 Relax in style at The Huntington Hotel, perched atop San Francisco’s beautiful Nob Hill. Overlooking charming Huntington Park, stately Grace Cathedral, and the city skyline, San Francisco’s iconic cable cars glide past the front of the hotel. Union Square, the Financial District, and Chinatown are all nearby. The staff proudly welcomes guests with warmth, elegance, and legendary hospitality time and again. The Huntington Hotel, a member of Historic Hotels Worldwide since 2016, dates back to 1924. The Big 4 restaurant is named after the businessmen, philanthropists, and railroad tycoons who built the Central Pacific Railroad: Leland Stanford, Collis Potter Huntington, Mark Hopkins, and Charles Crocker. Adjoining Rooms: The hotel offers adjoining rooms. Please contact to reserve. Parking: Self-parking: Not Available on site. Valet parking: Available; $54 per day. Rollaways: Available upon request; $35 per night. Learn more about the History of The Huntington Hotel .